Of course, this life-saving lesson applies to cyclists and pedestrians, too. If you're going to ride the wrong way across a bus route or walk across a restricted-access freeway, always wear a helmet and high-visibility jacket. I think the reason I was getting the doldrums last September was because normal people tend to take vacation over July and August, so e-mails slow down in general. The corollary to this is that they pick back up again in September. The important thing is seeing that 620 number being lower than what it was before. It means progress. 1. Allison has a list for this weekend. She blogged about it. 2. XUP also had a post on lists a while back. It was long enough ago that I've decided I'm too lazy to look it up. 3. I use many lists of various kinds to organize myself. They are helpful to keep from forgetting things. 4. Seeing many items crossed off your to-do list can give you a great sense of accomplishment. ; electronic to-do lists are bummers because you only see the items you haven't yet completed. 6. If you have a lot of things to do in a short period, like things to get during lunch hour or places to go on Saturday, number the items in the order in which you plan to do them. Put your list on your handlebar-mounted clipboard to track your progress. 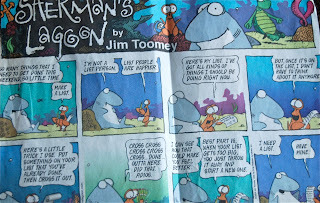 H. Sherman's Lagoon had a really funny Sunday strip a few years back about lists, which I can't find online anywhere. Probably 2004 or 2005ish. I cut it out and gave it to my dad, which I think is lost. Hawthorne (the crab) was telling Sherman (the shark) about how useful his list is. a) Sherman: "Wow. I need a list." b) Hawthorne: "Here, take mine!" 10. Lists only work if you remember to consult them. This is what differentiates "list people" and non list people. 11. Lists are generally non-transferrable. 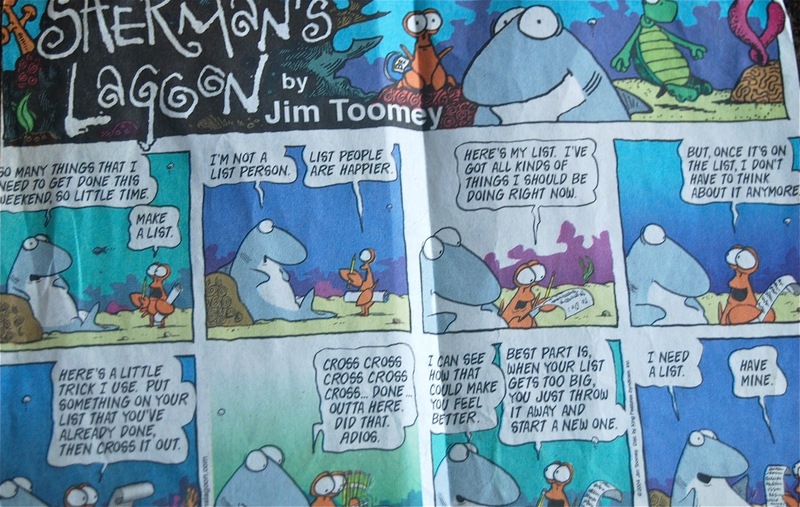 Even for highly organized people, everyone uses and understands lists differently. 13. Similarly, when I remove my shirt at the end of the day (and it's still clean), I hang it in the closet to the left of all the other shirts. Over time, this creates a quasi-list of shirts I've worn, from most to least recently. 14. I like to use lists as insurance against forgetfulness. I think I might have said that already. See items 3 and 10.